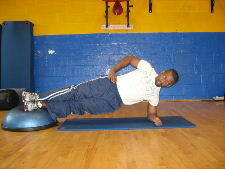 Some people think the best core exercise on a Bosu Ball is the moving side plank. 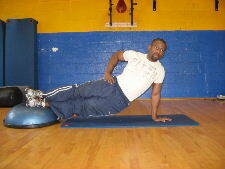 I think the Bosu Ball is a great tool for ab exercises and core exercises. 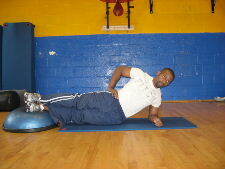 Below are pictures of 2 core exercises on the Bosu Ball to increase core stability and strength. Starting Position: Begin by placing your elbow on the floor and place your feet on top of a Bosu Ball. Keep your body in a straight line and engage your abs and core muscles. Form: Inhale and slowly lower your hips towards the floor until you feel a slight stretch in your obliques. Hold briefly when you feel a stretch, and then lift back to the starting position. Personal Trainer Tips: Move in a slow and controlled manner. Moving slowly helps to build up endurance in your core muscles and prevent momentum from taking over. Keep your elbow directly underneath your shoulder. Make sure to stay strong on your elbow and shoulder. Don't let your shoulder sag. You can use 2 different foot placements. Stagger your feet one in front of the other for more stability, or stack your feet one on top of the other to really challenge your core stability. Starting Position: Begin by placing your hand on the floor and place your feet on top of a Bosu Ball. Keep your body in a straight line and engage your abs and core muscles. Personal Trainer Tips: If the moving side plank exercise is too difficult, try mastering the isometric side plank on the Bosu Ball. Core exercises are an important part of an overall fitness program. 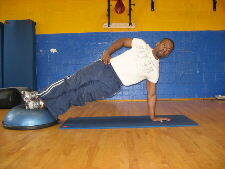 But remember the best core exercise for an advanced exerciser might not be the best exercise for a beginner. Lastly, visit the Picture Directory of Abdominal and Core Exercises to find the best core exercise for your workouts or try one of the free core workouts.